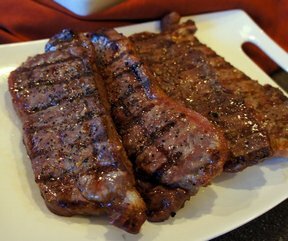 Grill Mates® Montreal Steak Seasoning combined with sweet brown sugar will give your steak superb flavor. 1. Mix Steak Seasoning, sugar, onion powder and oregano in small bowl until well blended. Generously season steak with spice mixture. 2. Grill over medium-high heat 8 to 10 minutes per side or until desired doneness. Test Kitchen Tip: Try with the newer cuts of steak available in the meat case, such as hanger steak, round sirloin tip center steak, shoulder top blade steak (flat iron), shoulder petite tender steak or shoulder center steak (ranch steak).